Powerstar Pawan Kalyan unveiled the teaser of Nikhil’s upcoming crime comedy, Shankarabharanam, just a while ago on the sets of Sardaar Gabbar Singh at Ramanaidu Studios. 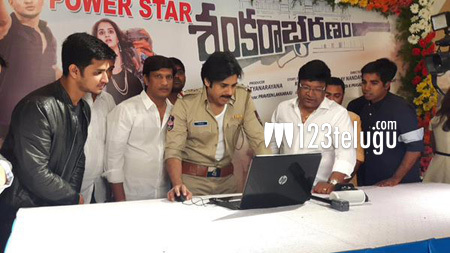 Apparently, Pawan quite liked the teaser and appreciated the team’s efforts for bringing out an interesting film. Shankarabharanam is a crime comedy which showcases the story of a rich NRI who visits Bihar and runs into a tiff with notorious Bihari mafia gangs. The film’s teaser gives glimpses of brilliantly shot visuals and the film’s intriguing plot. Nikhil impresses with a stylish makeover. Naditha Raj paired up with Nikhil and Anjali surprises in a Bihari mafia don’s role. Debutant Uday Nandanavanam directed this film and senior writer Kona Venkat is presenting it.